We don’t have a process to ensure that emails to our internal list (contact@coops.tech) are replied to in a timely manner/at all. At the moment we have 5 legitimate-looking emails from the 13 March that don’t appear to have replies. I hope that encouraging people to post to the forum will increase the chance that they receive a reply. I think there are further improvements we can make, by clarifying the joining process for example, but this is a good enough start. The changes are currently available on the dev version of the site at https://www.dev.coops.tech/ but I don’t seem to have permission to make them live. Assuming there aren’t any objections to this change, can someone with the necessary powers either grant me access to deploy, or deploy the site to live please? Great idea! Let’s make it live @chris ? That is odd, @chrisroos are you sure you don’t have permission to click the production deploy link shown in the screenshot below? I have updated the live site. I’m afraid I hadn’t even noticed the double arrow button and wouldn’t have known that it deployed the site. Instead I was trying to visit the GitLab environments mentioned in the Deployment section of the README and didn’t have access. 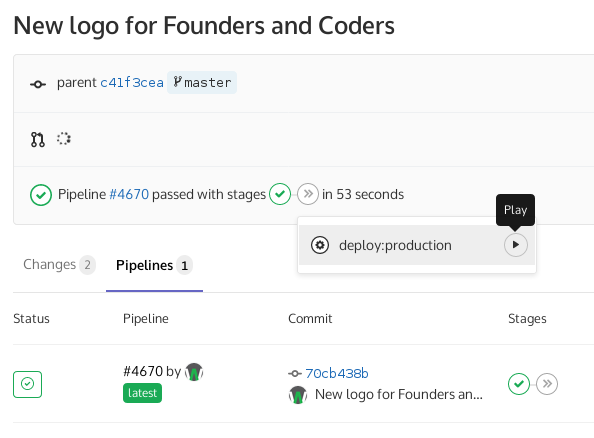 Since raising this issue I’ve been made a maintainer of the website repository (thanks, whoever did that) and can now see the environments in GitLab. I’ll update the README to better describe how to deploy to production now that I have access. Thanks @chrisroos, the changes to the deployment method was implemented by @nick at the last CoTech event in London and I guess some people didn’t get a chance to see a demonstration of this. 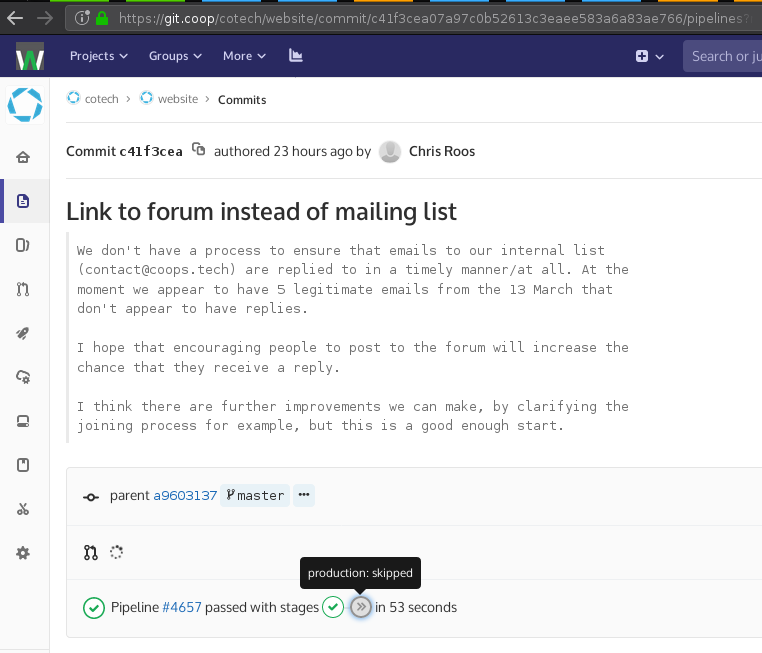 I added you to the CoTech group on git.coop and this is probably the cause of you having maintainer access to the website repo. I’ve updated the README in https://git.coop/cotech/website/commit/6f209445fc5dcae70e89e6d605609d92b0950104.